The death has occurred of John McCarthy, the founder of the mental health lobby group Mad Pride. John was a very powerful advocate who campaigned for the human rights of persons who experience mental illness. He campaigned for the abolition of mental health laws that permit the “mad community can be locked up without trial forced treated and forced medicated.” See here. 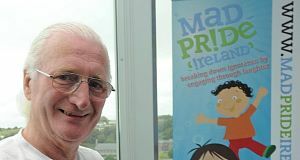 Through Mad Pride John sought to promote understanding of the issues surrounding mental health by engaging the community to participation in a fun environment. He will be sadly missed by his family, friends and the by all those he has touched.